Menorahs are strongly associated with Jewish culture due to their shared and storied history. These highly symbolic fixtures of our faith have endured into modern times and remain an iconic representation of Judaism. Electric menorahs are a contemporary alternative, delivering all the significance and beauty of a traditional menorah with added safety and sustainability. Zion Judaica is your Internet destination for electric menorahs of all kinds. At Zion Judaica, we are proud to offer a wide range of menorahs to light every walk of life. We have a full selection of electric menorahs for display in the home as well as large menorah for public display. Add a shtik of Judaica to a hospital, school or bank with our oversized electric menorahs. An electric menorah is a stellar way to give heed to the old ways while keeping current. Zion Judaica carries a variety of electric menorah styles to help you find the perfect menorah for your lifestyle. We have low-voltage menorahs to help keep your high praise low impact. Some of our menorahs have flickering bulbs to replicate the luminous twinkle that has bathed Jewish homes in light for thousands of years. Keep the treasured ideal of universal enlightenment alive into the future with an electric menorah from Zion Judaica. We carry a range of replacement bulbs to keep your electric menorah burning bright for years. We may be able to offer you a bulk discount on select volume orders. Call and speak with one of our professional representatives for more information. 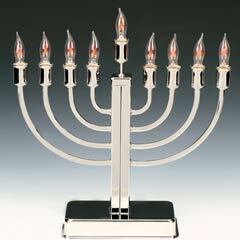 Here at Zion Judaica, we strive to provide our customers with the best selection of electric menorahs on the Internet.